Properly running and growing a business is no easy feat. To attain success, you must actively engage with your customers, increase your production and quality of service, and work plenty of hours to meet demand. You also have to think about something equally critical: your IT. Much like the other facets of your business, your technology and the attention it demands should constantly evolve and change to match the needs of your company. Adopting new technology and changing the way you do things can be scary. But, with a proper technology provider on your side, you have nothing to fear. Businesses all over the world are rapidly switching to cloud computing to stay afloat in competitive markets. In fact, 74% of businesses feel like cloud computing has given them a competitive advantage. You’ve probably heard something about it, but what exactly is cloud computing? Simply put, it’s the practice of storing data and using programs over the internet, instead of those hosted on your own computer’s hard drive. It means that you no longer need a bulky server in your office to hold all your company files and programs. Cloud computing can be a great boon to your business, but only if it is established and maintained properly. A well-designed cloud infrastructure means you have streamlined organization with your data that allows you to use it to its full potential. Cloud computing is built around your needs. A study by the venture firm North Bridge found that 90% of organizations use the cloud in some way, with 50% using cloud services as their preferred solution. You can tell by the rising cloud adoption rates that the majority of the business world is embracing cloud computing technology. You rely on your data on a day-to-day basis; it’s your lifeline. The way you handle your data is not the same as any other company because after all, no two companies are exactly alike. Just as your company is totally unique, so are your needs for a cloud architecture. Professional cloud services offer you a truly custom cloud solution. Using professional services ensures that your cloud is custom-tailored to meet all of your specific company needs. Having a personalized cloud system in place means that your company will experience enhanced workflow, greater efficiency, and an overall boosted bottom line. All of this sounds well and good, but how do you know if it’s a good fit for you? In other words, how do you really know if your needs are being met? To understand that, we must first identify some of your needs. 1. Does your growing business need a scalable IT solution? One of the downsides to a rapidly growing business is the need for new solutions to keep up with the growth. What was working perfectly a year ago may be totally inadequate today. That’s where the advantage of the cloud comes in. Cloud services offer a flexibility that no other IT service can provide. Because the cloud is easily scalable, no company is too small or too large for it. Professional cloud services allow you to establish the options you need, without any of the ones you don’t. You can rid yourself of the burden of extraneous hardware, cutting costs in the process. Of course, if you need more cloud space or solutions, there is always room for expansion. The flexibility of the cloud makes it easy to adapt to any situation. 2. Do you need various programs and services? There are a huge variety of services available for cloud computing. For example, you may need to meet compliance requirements of strict industries, such as the medical field (HIPAA). With professionals setting up your cloud computing network, you have a guarantee of full compliance. Additionally, you’ll find many tiers of service, a multitude of add-ons, and lots of customization options available for your cloud infrastructure. If your organization has unique requirements, the solutions to meet them are endless. The fluid nature of cloud solutions allows you to add-in any service that you require, whenever you need to. 3. Do you need enhanced security? Your ideal cloud solution should include some form of a security guarantee. By nature, cloud solutions are more secure than your locally hosted files and servers. Your cloud is hosted in a remote facility that is physically secure. In addition, your data is backed up and protected by programs that far exceed the in-house security capabilities of the average business. And if that weren’t enough, a professional cloud service provider also ensures additional levels of redundancy, which means that you’ll never go without your data if a problem occurs. Previously, you had no other option than to be anchored down by your office computer. If you were at home and wanted to get work done, you simply couldn’t do it effectively. With locally hosted file systems, the only way for most employees to access the data was by being in the office. Fortunately, the cloud changed that. Working with the cloud allows you to access all your files seamlessly (and securely), even if you’re at home. Working from home is just one option. Using a cloud system means that you can work from anywhere, as long as you have an active internet connection. Since your files are stored online, you can simply log in to retrieve them and edit them whenever you have time. This opens up an opportunity for your company and its employees to work whenever they want or need, not just when office hours say they can. The technology behind the cloud is always evolving. Thanks to many advancements, we are also beginning to see lots of flexibility in how to access data. You no longer strictly need a laptop computer with a traditional operating system to access your files. You can work straight from your tablet and smartphone, which means that the cloud is not only everywhere – it’s also more functional and portable than ever. Okay, so clearly cloud services offer a lot in terms of technical capability. But how do they boost productivity? How do they actually affect your daily workflow? Let’s say you’re on a business trip. You’ve got a five-hour flight ahead of you, and you only brought your tablet. You have a meeting soon after you land, and you decide you’d like to revise the presentation that you’re supposed to give as well as go over your talking points. Without the cloud, kiss your productivity goodbye. You just lost five valuable hours of time. But, if you are working with the cloud, you can sit in your seat, connect to the Wi-Fi, and instantly pull up your presentation on your device. You now gained five valuable hours of time to work. With the cloud, you have more freedom to be productive. Simply put, your bottom line grows when you’re always connected. Any unproductive time can cost you money. But with cloud solutions, your unproductive time becomes instant productivity, every time. Here’s a shocking fact – downtime is bad for your company. When your systems are down, you simply can’t do business. Every second you can’t work means possible money going down the drain. Downtime doesn’t just pause your business. It also can be very expensive to fix, depending on how your file system is structured. If you don’t have dedicated support, the onus to fix your servers falls upon you. Alternatively, if you do have dedicated support, you still need to wait for a technician to diagnose and repair whatever problem there may be. That may not be as expensive as downtime, but it definitely isn’t free. With a dedicated cloud architecture, your downtime is drastically minimized. As stated in a section above, cloud solutions are extremely redundant. They operate from secured data centers with generator backups and high-speed fiber connections. They’re also typically backed up to other data centers in different locations so that if something happens to a data center, your data is still secure elsewhere. For example, Microsoft’s Office 365 attained a 99.99% uptime for an entire quarter of a year. It means that you can stop worrying about the cloud going down. You don’t have to worry about wasting productive time and losing money. You can focus on growing your business while relying on your data to be completely secure. Easily collaborate in the cloud. You want your employees to work as effectively as they possibly can. What better way to do so than with cooperative efforts? Working together not only provides better overall results but also increases efficiency within your company. With a properly established cloud computing architecture, your business can work together as a team to experience individual, group and corporate benefits. If your documents are kept in an organized file structure, they will be easily located by other employees. That reduces the time your coworkers need to hunt for that file you want them to update. You can also set alerts on files to let them know if it’s time for them to jump in and edit. As an added bonus, you can also see the version history of documents, allowing you to track all changes made to all documents. Sending files to other people has always been a burden. Large files, such as hefty PDFs and videos, are troublesome to transport. Since most email servers cap out at a certain size (typically less than 25MB), you are limited in what you can send over to your coworkers. The cloud bypasses this by allowing you to directly upload to the server. That completely removes the need to send any file, resulting in the end of “failed to send” bounce-back emails and eliminating costly delays. The ability to work in real time. Sometimes, documents need to be actively worked on together. Your team can simultaneously edit one document without needing to be in the same room. Their edits will be tracked and updated in real time and then viewed by anyone who has access to the document. This not only allows for seamless collaborative work but also provides full accountability for the work that everyone does. As we keep stressing, cloud computing solutions are about more than just mobile files and anywhere access. They’re a way to simplify your control over your data. By having a professional establish your cloud architecture, you’re boosting your own control over your company. You can easily manage permission settings on all your files, so you can decide who sees what. An easier way to work together. Combining these benefits shows you the true power of cloud collaboration. A whopping 85% of enterprises currently have a multi-cloud strategy. It’s easy to see why; so many businesses are adopting cloud structures to gain a competitive edge. Using cloud strategies means your company can produce more meaningful work at a higher rate. Collaboration within your company is a key factor to success. But what about widening your pool of talent? What can the cloud do for those that are deemed “remote workers”? Introduce remote work to your business. First, a definition. A remote worker (also called a telecommuter or a teleworker) is a person who works from home or abroad. These employees can provide valuable input to your company. In years past, remote workers and employers alike faced logistical nightmares when coordinating work schedules and scope. Gain access to untapped talent. Here’s a hypothetical example. You own a real estate acquisition company that wants to expand its business overseas. It would be extremely costly to train your employees to learn the foreign markets and send them to other countries. Instead, you decide to hire the perfect candidate who is already knowledgeable in the real estate market there and is currently based in your targeted country. Thanks to cloud technology, you can fully utilize your remote workers’ skills without losing productivity or visibility. Telecommuters can work on their schedule, collaborate with you and your team in real time, and connect to your systems from across the world. You just saved a lot of time and effort and spared plenty of money in the process. You can certainly broaden your employment horizons with telecommuting. However, your remote work doesn’t necessarily have to come from the other side of the globe. Integrating remote work with your current employee base can have some surprising effects. For example, employees who work from home are, on average, 13% more productive than those who work in the office. They take fewer breaks, call in sick less often, and make more calls per minute. As an added bonus, they’re also more likely to stay with the same company for a longer period of time. Aside from productivity, integrating cloud-based remote working can also have a positive effect on employee morale. 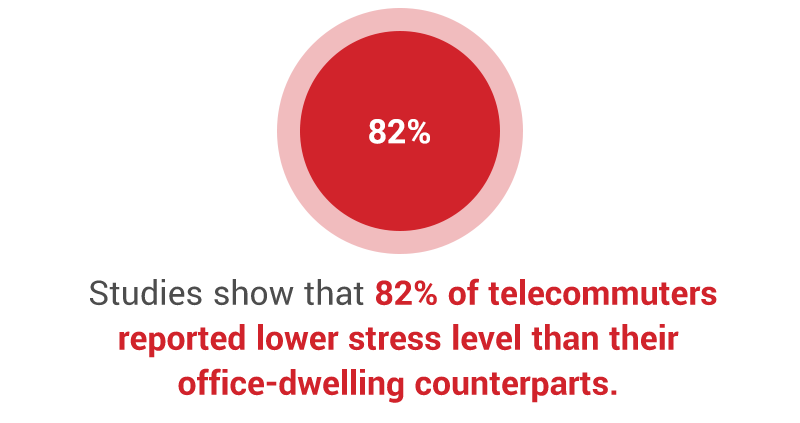 Studies show that 82% of telecommuters reported lower stress level than their office-dwelling counterparts. That results in higher performance, better work, and an overall happier work environment within your organization. Your costs keep getting lower. A very real benefit to having remote workers is lower company costs. Companies of all sizes are reporting significant savings in real estate. In a nutshell, having remote workers means you don’t need to constantly expand your office. The concept of a “flexible workspace” is saving companies millions. Take Aetna, for example. With 2,000 of their employees utilizing flexible workspaces, the company has saved on 2.7 million feet of office space. To put it into perspective, that saves the company about $78 million per year. You also need to take into consideration the benefits of lowered operational expenses. Employing remote workers means reduced office supply purchasing, less money spent on company events, and reduced electricity bills. Consider the possibilities of remote work. Understandably, some employers are uneasy at the thought of encouraging team members to work remotely. Allowing remote working means you must trust your employees to work diligently, and not procrastinate or waste company time. You may not be ready to fully accept telecommuting. There is good news for these employers. You don’t have to completely shift to remote work. Incorporating remote working as part of your business rather than an all-or-nothing scenario has massive benefits. 45% of all telecommuters work remotely five or fewer days a month. Even when offered on a limited basis, working remotely is still beneficial to your company. Pick your professional cloud computing partner wisely. Cloud computing solutions are proven to boost productivity, reduce cost, improve morale, bolster security, and give you the freedom to work from anywhere. Determining what is best for you is heavily dependent on who you are as a company, and what your goals are for the future. As we said, your company is completely unique – just like your customized cloud needs. There will be some hurdles to jump, so picking the right partner for you is critical to a building a scalable cloud architecture that will continuously work for you. Our team at RedNight Consulting will take the time to learn all about your business. We’ll learn your key strategies for success, and incorporate them to create a custom cloud setup that’s just for you. We’ll develop a roadmap for success and work with you to implement it as perfectly as possible. We want your business to grow, and with cloud computing solutions, we think we can help make it happen. If you’d like to learn more about how RedNight’s professional cloud computing services can help your business, contact us today.